The State of Rhode Island Department of Transportation (RIDOT) has awarded a $410 million construction contract to repair and rebuild the deteriorating urban interchange and highway known as the 6-10 Connector, running between the Olneyville neighborhood and downtown Providence. Utile and Nelson\Nygaard worked with the City of Providence to design 6-10 Connector options that increase the amount of developable land, untangle traffic snarls, and improve connections. 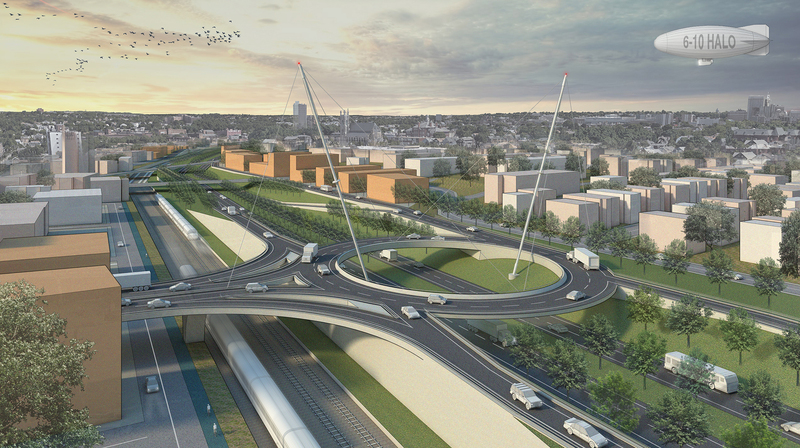 One proposal, dubbed “the halo”, included an elevated rotary to slim the existing highway footprint and reconnect isolated neighborhoods. The final design approved by RIDOT includes several key concepts surfaced through the Utile-led study, including the Tobey Street overpass conversion from highway ramp to neighborhood connector between the West End and Olneyville for bikes, pedestrians, and local traffic. You can read more about the project kick-off celebration in the Providence Journal.